Note: The method given below is for making the dough in a stand mixer. Place the flour in the bowl of your stand mixer, and add the salt on one side and the yeast on the other. Add the sugar, and the butter, cut into small cubes. Attach the dough hook to your mixer and begin to mix slowly. Add half the egg, and then the water and milk. Continue to mix slowly to form a sticky dough. Turn the speed on the mixer up to medium and continue to knead using the dough hook for 5 to 10 minutes, or until the dough is smooth and elastic. Cover the mixer bowl with clingfilm and leave the bowl in a warm place for about an hour, or until doubled in size. Remove the dough from the bowl once it has doubled, and roll it out on a floured surface to form a rectangle. Chop the apricots and apple into small pieces and place them on the dough. Sprinkle over the cinnamon and light brown sugar. Roll up the widest side to form a roll. Slice the roll in half using a sharp knife. Twist the two strands around each other and then form into a circle or coil. 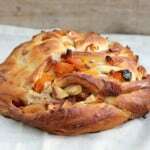 Place the couronne on a lined baking tray and allow the dough to rise again for about 30 minutes. Use a pastry brush to brush the remaining egg over the dough when you are ready to bake it. Preheat your oven to 180 degrees, and fill a hot baking tray with boiling water from the kettle just as you place the couronne in the oven, to create steam. Check the bottom of the couronne by tapping to ensure it is cooked through.